cle energy into the Earth’s magnetosphere. ing also the middle atmosphere and the troposphere [3,4]. compute the effects of gigantic SPEs in the stratosphere. tude to more than 95% at 78 km was found . its loss, nor its production. during geomagnetic storm obtained by . the conclusion are given in Section 4. Southern Hemisphere (SH): 20˚, 40˚, 60˚ and 70˚. nated in favor of 309 nm and 322 nm on the new TOMS. within 3% - 4% of actual ozone levels. of 1.70 × 107 protons cm−2·day−1·sr−1 on 23 August. 46; Ap = 102) with a sudden commencement at 0613 UT. which started a relatively rapid recovery. 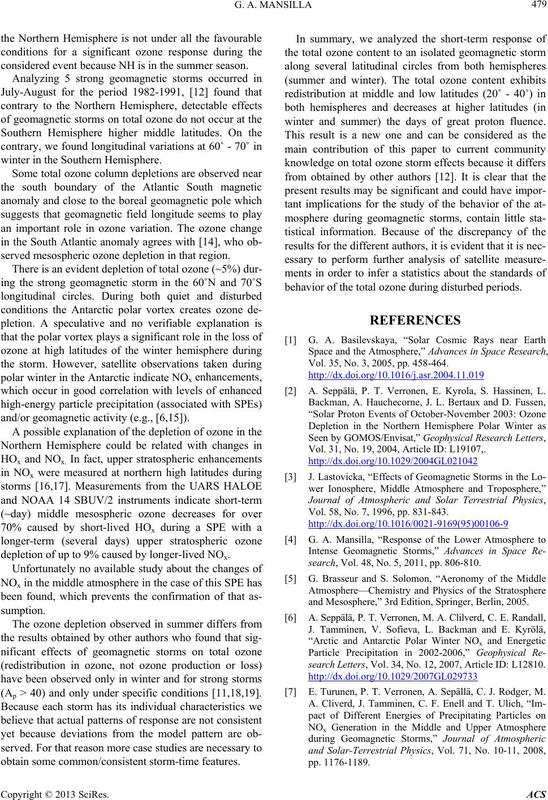 are shown in this paper. tween −120˚ and −100˚ of the Southern Hemisphere. Similar result (not shown here) is observed for 40˚N. tioned, and the average pre-storm values (in percentage). cur zonal re-distribution in ozone. geomagnetic storm occurred on 24 August 2005. −30˚ and −150˚to −120˚ in the Southern Hemisphere. and east sectors on 24 August. while at low latitudes (20˚S) they are sparse. considered event because NH is in the summer season. winter in the Southern Hemisphere. served mesospheric ozone depletion in that region. and/or geomagnetic activity (e.g., [6,15]). depletion of up to 9% caused by longer-lived NOx. (Ap > 40) and only under specific conditions [11,18,19]. obtain some common/consistent storm-time features. winter and summer) the days of great proton fluence. 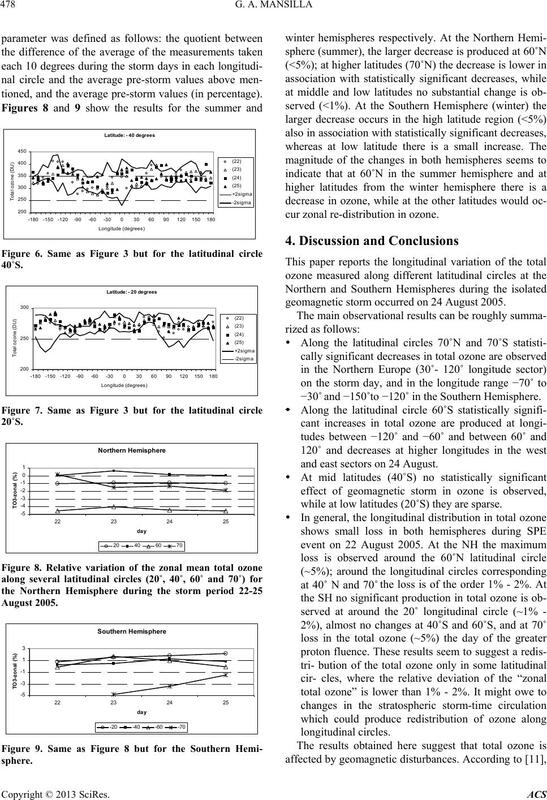 behavior of the total ozone during disturbed periods. Vol. 35, No. 3, 2005, pp. 458-464. A. Seppälä, P. T. Verronen, E. Kyrola, S. Hassinen, L.
Vol. 31, No. 19, 2004, Article ID: L19107,. Vol. 58, No. 7, 1996, pp. 831-843.
search, Vol. 48, No. 5, 2011, pp. 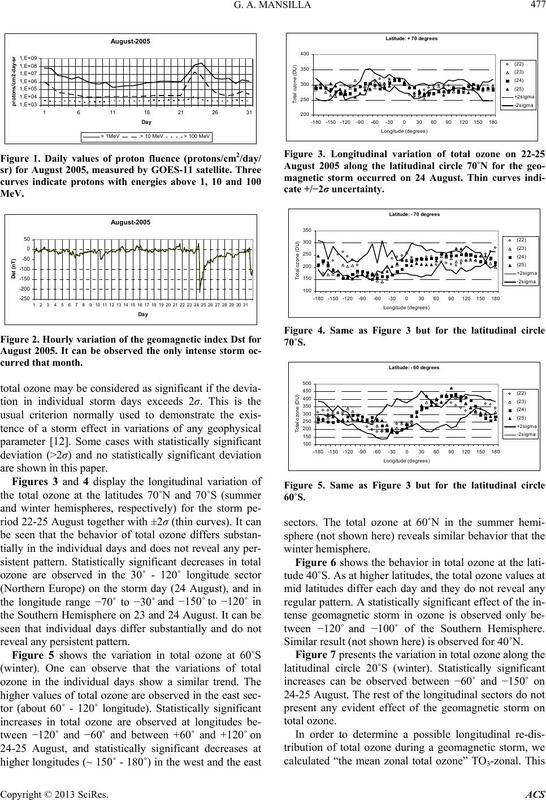 806-810.
and Mesosphere,” 3rd Edition, Springer, Berlin, 2005.
search Letters, Vol. 34, No. 12, 2007, Article ID: L12810. E. Turunen, P. T. Verronen, A. Sepällä, C. J. Rodger, M.
 C. H. Jackman, D. R. Marsh, F. M. Vitt, R. R. Garcia, C.
No. D11, 2009, pp. 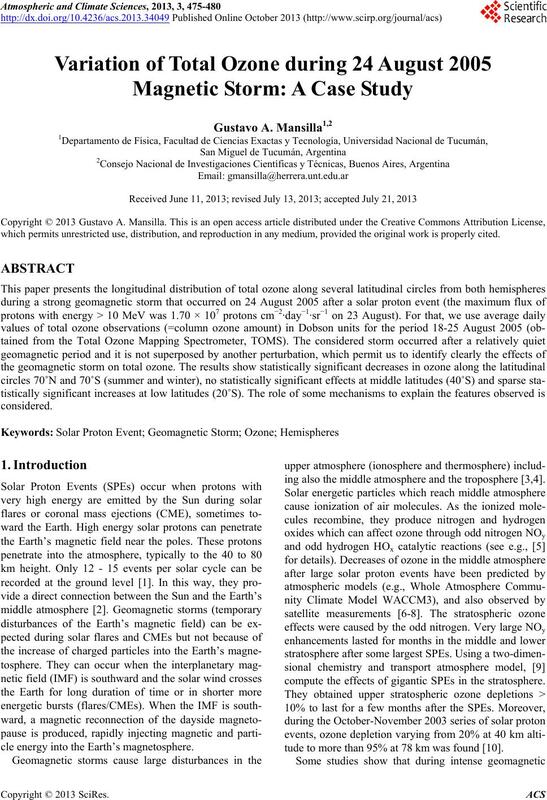 1984-2012.
sphere,” Journal of Geophysical Research, Vol. 105, No. search, Vol. 110, No. A9, 2005, pp. 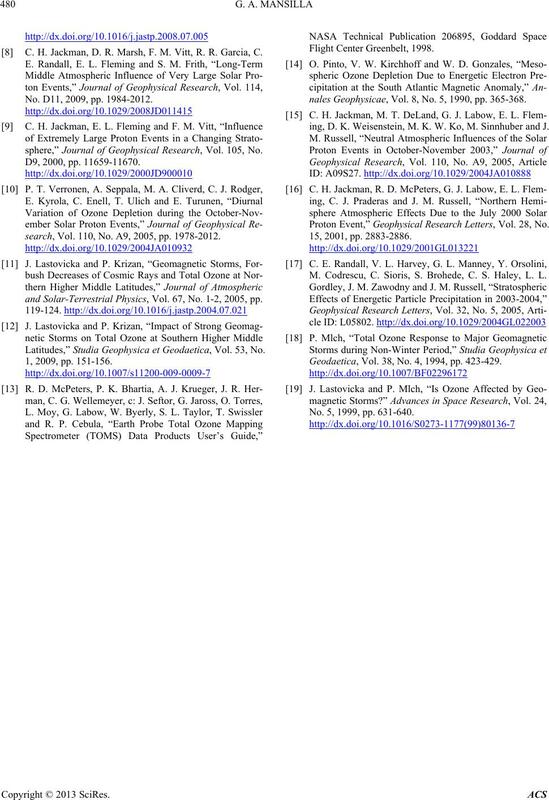 1978-2012.
and Solar-Terrestrial Physics, Vol. 67, No. 1-2, 2005, pp. Latitudes,” Studia Geophysica et Geodaetica, Vol. 53, No. nales Geophysicae, Vol. 8, No. 5, 1990, pp. 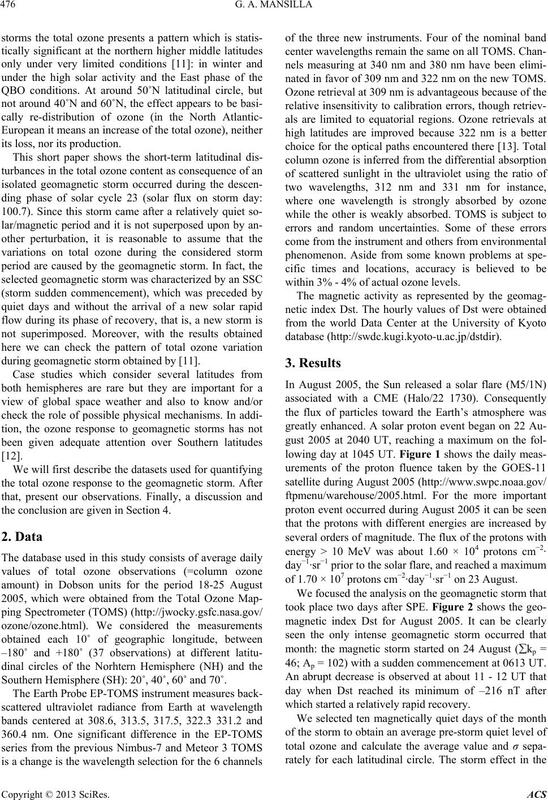 365-368.
ing, D. K. Weisenstein, M. K. W. Ko, M. Sinnhuber and J.
Proton Event,” Geophysical Research Letters, Vol. 28, No. M. Codrescu, C. Sioris, S. Brohede, C. S. Haley, L. L.
Geodaetica, Vol. 38, No. 4, 1994, pp. 423-429. No. 5, 1999, pp. 631-640.